From Tuesday the 26th January road works are taking place on Whitchurch Road, for 10 weeks, between the Cater Road roundabout and the Hareclive Road junction (Opposite the Lidl Supermarket). From Whitchurch Road the AirDecker will turn left onto Cater Road. 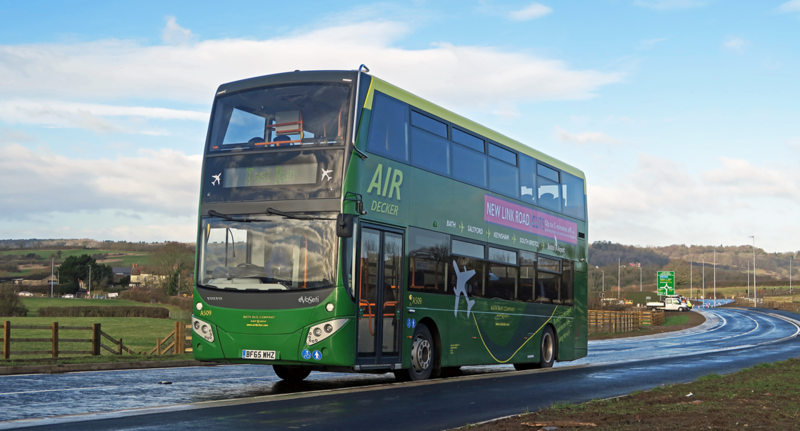 The AirDecker will travel along Cater Road until it reaches the Cater Road roundabout to re-join the normal service route. This entry was posted in Uncategorized on January 26, 2016 by Connor Flavell. On Saturday 5th September 2009, after lengthy negotiations with the MOD at a very senior level, Bath Bus Company was permitted, with the cooperation of several other operators, TfL and County’s Transport Department to operate a bus service from Warminster to the village of Imber and other points on Salisbury Plain. The village is no longer inhabited as the residents were evicted just before Christmas 1943 by the MOD, in order to step up army training in advance of D-Day. The villagers were promised that their village would be returned to them after the war but this was not to be and 73 years on it is still uninhabited, much of it having been damaged or destroyed. It remains in use for army training purposes. However, the connecting road is open to the public on a limited number of occasions each year, one such occasion being selected for the one-day service. This year’s Imberbus will be held on Saturday 20th August 2016, with further details to be released in due course. This entry was posted in Uncategorized on January 6, 2016 by Connor Flavell.